We had passed Manoâ€™s Greek Taverna several dozen times in the 7 months since it opened its doors just a few meters from the Tagaytay rotunda when driving up from Manila via Santa Rosa. It always seemed inconvenient to stop and we kept putting it off until one of my readers Spanx suggested I check it out. I also thought I would try it in honor of Schatzli, one of my first and most frequent visitors since I started the blog. She calls Greece home and I thought I would see if this restaurant would do Greece justice. We arrived early last Sunday under a clear blue sky worthy of a Grecian landscape. We were the only ones in the restaurant. With a very literal blue and white Grecian color scheme, it was modestly appointed but clean and light filled. Mano is from Crete and married to Stella, who I think hails from the Ilocos region â€“ they moved back from Greece and decided to open a restaurant in Tagaytay where the weather was more pleasant. We decided to order mostly appetizers and light dishes so we started with some Tzatziki or cucumber and yoghurt dip. A nice rendition, this was surprisingly â€œfreshâ€ tasting and we were later told that Mano makes his own yoghurt on the premisesâ€¦which would explain the appeal of the dish. Served with slices of dense homemade bread, this was just the right start to the meal. We also ordered a saganaki, or a dish of shrimp with tomatoes, feta and oregano and other spices. This was pretty good, though leaving the shells on the tail end of the shrimp was distracting. Overall, the flavor was good and again it went well with the bread served. We later found out they had taramasalata (caviar dip made with fish roe hand-carried back from Greece) which wasnâ€™t on the menu and bummed we didnâ€™t order that. This is not fine dining. It is home-style Greek food with soul. Precisely why it is called a taverna. If you have a hankering for Greek food and you are tired of all the same old same old restaurants on the Tagaytay ridge, this is worth a stop. We never got to the grilled meats and fish that are supposedly Manoâ€™s specialty so I will definitely go back for more. What I really liked about the place is its obvious honesty. Run by a Greek with a passion for his food. Everything cooked in extra-virgin Greek olive oil made right on the plantation of the restaurant ownerâ€™s family. They use freshly made homemade yoghurts and in the future, they will attempt to make their feta cheese from scratch. They also bake their own bread. And despite all those positives, our generous spread with 3 drinks cost just PHP715 or less that PHP250 a head. With prices like that, you can deal with a few fumesâ€¦ I personally liked Manoâ€™s and will return to try their other offerings soon. “Obvious honesty?” What an interesting way to describe a restaurant. =) I’ve seen Mano’s a number of times as well — its stark white facade just grabs your attention. Thanks for the write-up. wow. . . I will definitely try this sometime. . .
MARKET MAN… WHY DONT YOU JUST COME HERE AND I WILL GIVE a GASTRONOMIC FEAST HOLIDAY, i guarantee you will have the best greek holiday in your life. If Bayi (one of readers is reading now) he should be able to tell you what a wonderful hostess I am hehehe…. I took the Bayi family to a place where locals go MM with a tour to the market to show him the Levantin influence of this city. there are different kind of saganaki… a plain saganaki is fried hard cheese, fried then baked to melt the cheese. A good kaseri (hard type of cheese from the north is ideal for this) must have a tangy taste. you squirt lemon then eat it piping hot. GARIDES SAGANAKI is a great dish but the quality of the feta and the freshness of the shrimps play important role for this dish. 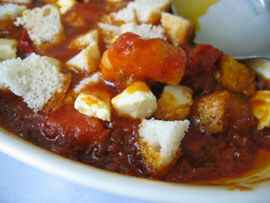 Then the greeks dip their bread into the tomato sauce. I normally enjoy garides saganaki at sea food taverna when I know the shrimps are fresh. SAGANAKI is actually a thin alluminium two handled frying pan used to cook and serve this dish. TARAMA is the roe once made into salad its called taramosalata. I paid 3euro for half a kilo today which my sister will hand carry for Celia Kusinera back to UK. He makes his own yoghurt? wow.. !! I make my own taztziki, with lots of garlic and a bit of dill. About feta, the greeks will sue you if u make feta there and call it feta hehe, it has to made in greece you know.. from sheep’s milk. DOLMADES.. cabbage roll its bland if not served with LEMON EGG SAUCE. the sauce adds taste. greeks do not use cabbage, they use vine leaves. WHAT ELSE IS IN THE MENU??? The greeks grill fish then simply serve fish with olive oil and lemon. oh dear i will drive manos crazy…. well for some europeans and americans this can be a shock. you DONT GET MAIN COURSE PLATE.. all food ordered are placed on the middle and every body just pick a bit of this and that and the small starter plates are used. If not too famish .. just order variety of starters, a very acceptable norm in greek tavernas. Thank you thank you thank you! I have passed by this place a number of times and have been dying to try it…I spent a couple of months in Greece before and miss the food terribly! You know what’s funny, despite the stark facade, or perhaps because of it, I kept thinking, “There’s a Greek person in there making the food, I just know it! I must try it!” There was something about it that I couldn’t put my finger on but your comment about “obvious honesty” is close…I’m so excited now!!! Thanks again! Will definitely try this resto when I find myself in Tagaytay. I have a lot of ‘back-reading’ to do marketman! I didn’t have an internet connection for 12 days. Thanks to a “technical activity” at my base station according to my ISP. Oh well, I guess availability and accessibility are service concepts still unknown in these parts… Can you just imagine 12 days without market manila!?! Same here… I’ve been intrigued by that restaurant everytime I pass by but for some reason, I’ve never stopped by to try it out. Most of the time, it’s because I’m full since the last few visits to Tagaytay were for dinners. Hehe! The next time I pass by, I will. Greek Food! There’s greek resto close by our office. I think it’s very authentic since the guy who owns it is a true blue. I love his roasted chicken with a lemony taste to it and also his octupus! Yumm!! Greek food is an acuired taste though, don’t you think? The cheeses are kinda on the tart side as well as the yogurt. they have a comment on the greek salad. can i comment for rampau? i have the 2 food lovers on my side talking about rampau’s comment…. greek food is not an acquired taste, it’s perhaps what you get in manila is few selection. unlike here we have a choice of going to grill (meat taverna) or sea food taverna. you probably do not get much choice what the chef has to offer. also… quality of the produce prepared in a taverna is also crucial. greek food is actually simple, relying on freshest products from land and the sea. example: fish – they just put salt and pepper, grill over charcoal and serve with olive oil and lemon. greek food too uses a lot of tomato sauces. similar to some italian dishes. ACQUIRED TASTE: you can not say this to greek cuisine or to any other cuisine. Food here is a way of life, full of passion and love. ACQUIRED TASTE for me is eating raw fish like sashimi or enjoying freshly grated truffles that taste like earth. MM, I’m basically new to your site and I have fallen in love with it (honest! ):) I’ve also heard about mano’s from other bloggers and friends but have not been there as of yet. your review of the place makes me want to drop everything and go there right now! They have the Saganaki that schatzli talks about is available in Mati in Rockwell. I tried it several months ago –very salty, but I loved it. Their Garides Saganiaki’s good too. Much pricier than Mano’s, though! I’ve passed by this restaurant a lot of times too. Will try out soon. Everything sounds good plus I like lamb =D. this sounds great! must try soon. that’s what i love about this food blog…it’s partly for the liveliness of the exchange by commenters…and the tons of information i’m acquiring. thank you all! Oooh, lovely! We have Tagaytay travel plans in the works, so have added Mano to the list of places to try. Thanks for the review MM. sha, i beg to disagree… taste for different cuisines for some people have to be acquired. mr. jeffrey steingarten (vogue food critic) used to hate greek food. but on one hand, i agree with you that greek food is quite limited here and they’re not so great, hence the lack of greek food fans on this side of the world. but i love the dolmades at pasha! yum!!!!! Thanks for the review MM. I will try it next time. owing to the two excellent reviews from you and anton! mandy, Pasha is a turkish joint. Actually, turkish cooking, which is brilliant and well-suited to the pinoy palate, is pretty similar to greek cuisine, thanks to the ottoman empire. Greek gyros (and arabic shawarnma for that matter) is really a takeoff from the original Turkish doner kebab. I prefer turkish food to greek to be perfectly honest. From deep of my heart we thank you,you incourage me that much to keep on going my taverna, my family welcomes you all the time. Kali orexi-ÎºÎ±Î»Î· Î¿ÏÎµÎ¾Î·. MM, Schatzli speaks the truth. Our trip to Athens was last June and until today, I still have very vivid memories of the “gastonomic feast”. She must have been a regular at the restaurant because the owner was extremely hospitable. The Owner even insisted on offering a shot of local moonshine to all of us! The food was really fantastic, out of the world. Grilled octopus, yoghurt dip (this specialty really tastes much better in Greece than what we have tasted elsewhere) and a number of other local delicacies which Schatzli posted in the blog. Every time I try something Greek, I just can’t help thinking that it never tastes as good as the authentic Greek experience. And wine is always available to go with the food. Yes, glorious white wine! This Greek experience has been etched into my mind and I keep thinking how I can get back there just once more at least, for a longer stay, of course. Schatzli was naturally the perfect host, not to mention her extremely affable husband. My wife and I are still waiting to return the favor to both of them when they come to Kuala Lumpur! In three weeks’ time I’ll be hosting a prominent Filipino blogger and his soulmate in Kuala Lumpur and I intend to give them a real gastonomic experience in the tradition of Schatzli! Cheers! hi marketman, can you please tell me where this restaurant is located exactly? i’d like to drop by soon and perhaps do a small feature about it for some of the publications i write for. thanks! uncommonjive, the restaurant address is officially Barangay San Jose, Tagaytay. In lay man’s terms, you drive to tagaytay using the Santa Rosa road and when you get to the ridge, keep going towards the rotunda and about 200 meters before the rotunda, in front of a church, is this restaurant, you can’t miss it. Their landline is 860-2559 and cell 09164298358. But as I say in the review, it has its pluses and minuses. Objectively, not as huge a hit as say Galileo Enoteca was for me, but great value nonetheless. Perhaps you can do a feature on Marketmanila also so my readership broadens…heehee…kapal ba? Does that mean I have to cook you a brilliant “Gout Dinner” to gain mention in those esteemed publications??? A little foie, a nice steak, some shellfish and a creme brulee… some real foodie guests… you see a storyline building??? Heehee. Wow, I havent visited in a while and there was a lively discussion on my comment. Well Sha, I’m not in Manila, I’m in LA and I’ve travelled to many Cities so I have an experienced palate. I’m a big foodie for God’s sake so I’ve been to hundreds of restaurants everywhere. There’s a lively Greek community here with plenty of restaurants and plenty of choices. Most cuisines that are new to your palate takes getting used to. That’s what I mean about acquired taste. There are some cuisines that you like on first taste and there are some that grows on you. Dont need or appreciate your lecture. you’re giving me a really good idea here, marketman… i’ll get around to doing exactly that, perhaps after i wipe my rather full (at the moment) plate.. late next month perhaps! Thanks a lot for the tip. My friends and I went to Tagaytay City last Saturday with no specific destination in mind when we remembered your write up on Mano’s Greek Taverna. And we didn’t regret trying those dishes. We’re definitely going back there one of these days to sample the others. I have been there, it is a nice place with nice food. tzaziki can be improved though…i like it thicker and a touch of dill. Greek food is one of my favorite. All mediterranean food actually. I mean, the turks/egyptians/greeks all claim fame for tzaziki and shoarma/gyros. it doesn’t matter. I have been to greece, done the island hopping. Eating tzaziki with fries for breakfast, lunch and dinner. Drink beer all day on the beach…..any way for nice gyros go to Pasha in greenbelt 3. Marketman.. after reading your review, my wife and I thought that we would check the place out. We arrived around lunch time and was warmly greeted by Mano himself. A very nice gentleman who proudly showed us many of his food articles. We felt very comfortable with him that I asked him to order for us whatever he recommended. He recommended the tzatziki (dip), manos salad, saganaki, moussaka and grilled lamb, his specialty. In addition, my wife also wanted to try their lamb gyro (shawarma). First came the tzatziki which was exactly as you described, very “fresh” tasting. Then came the salad which was also excellent! The feta cheese was so creamy and the tomatoes as red and juicy as a tomato can get. Unfortunately, this where it only got as good as it could get. The saganaki would have been good if they used fresh shrimp. The thawed taste of the shrimp emanated on the tomato based sauce. The lamb gyro on the other hand was the biggest disappointment.. it was tough! It was so full of unchewable ligament “litid” that my wife only had 1 bite and gave up on it. I thought of biting the other end (to check if it was also tough), and yes it unfortunately was. We opend the gyro and the lamb portion used was full of litid! It will be safer for one to order the chicken instead. The moussaka likewise did not taste freshly made. It might have been part of the leftover in the pyrex and was just reheated. And finally, his specialty, the grilled lamb. Although it had a good taste of herbs and spices, it was really nothing special. It was in fact a little tough to chew. The menu said it would also have 3 pieces, but only one came with the plate. I don’t know if their standards had deteriorated since your review, but the experience was disappointing and forgettable. paragon, bummer things didn’t turn out too well for you guys… I actually haven’t been back since I wrote about it but it would be unfortunate if things have slid backwards…Mano’s wife was the one in the kitchen when we ate there…I wonder if there have been changes since. I recently went and ate there. The owner was friendly and welcoming. I had lamb – one piece, not 3 as advertised – and it was not something I would order again. I suspect one of the problems with the lamb was that it is so hard to get in the Philippines – generally only expensive frozen Australian lamb, if you can find it at all. My wife ate Chicken. To be frank, I would describe ‘obvious honesty’ as ‘simple’. Overall, I would go back because I like Med. food. But if this taverna was in Greece, it would surely close – it would not withstand any competition. Same experience here with the lamb when I took my family for the third time— the meat was tough. But I would always go back for the baklava and my daughter for the grilled pork chop. Problem with Mano’s is the service. It really takes a long time to get your food served. I will go again in Christmas when I will be in Manila. we must have gone there on a bad day because we didn’t like the food that much. first of all as soon as we entered the 3 waitresses gave us blank stares. guess we didn’t look like we were there to eat. had to ask for a table, we basically sat ourselves. the shawarma was good and my son said the grilled striploin was good too. we just couldn’t get over the moussaka and the baked macaroni (for my 5 & 6 year olds), they were obvioulsy reheated. the macaroni was overheated, as in some of the noodles were toasted while the moussaka was lukewarm. how odd, not to be at their best on a saturday night, thought it would have been a peak day for diners. I like the grilled items especially the gyros and the pork chops. very good! not very tipid since what we got was 2 thick chops. very tasty and fresh right off the grill. i’ve been to this restaurant last october, since it was a part of our international cuisines exposure trip..
we loved the food, and how they prepared it with passion. what i remembered about mr. mano (the owner), is that he is so proud of his culture, food and his country, that he wants everybody to learn about his home country.. and that is his secret to the success of his taverna. If you want a gyro closer to the city, Cafe Mediterranean, in several malls like Rockwell or Greenbelt have a decent one. Greetings From Cape Elizabeth, Maine!